Kingdom Note Thysanostoma Thysanura aka Purple Jellyfish is from the Jellyfish collection, manufactured by Sailor and sold exclusively in the Kingdom Note Tokyo store. TT is a medium purple with a small pop of green sheen. In large swabs you can see the small pop of green sheen. Bleeding: Low-just a bit in the flex nib. On Staples 24 lb copy paper there was a bit of bleeding and feathering in the flex nib as well as some feathering in the other nib sizes. TT is similar to Monteverde Rose Noir. Click here to see the Kingdom Note inks together, and click here to see the purple inks together. I used a Pilot Metropolitan Retro Pop Purple with a medium nib on Tomoe River paper. The ink had a wet flow. 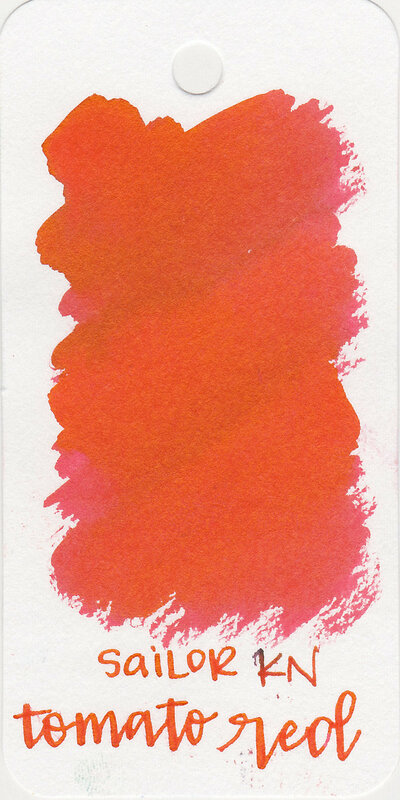 Overall, I like this ink, it’s a pretty color, dries quickly and has a nice flow, but does have a bit more bleeding than I prefer. I wish it was easier to get in the United States, but Monteverde Rose Noir is a similar alternative. Disclaimer: A sample of this ink was provided by a reader for the purpose of this review. All photos and opinions are my own. This page does contain not affiliate links, and this post is not sponsored in any way. Kingdom Note Tomato Red is from the Vegetable collection, manufactured by Sailor and sold exclusively in the Kingdom Note Tokyo store. 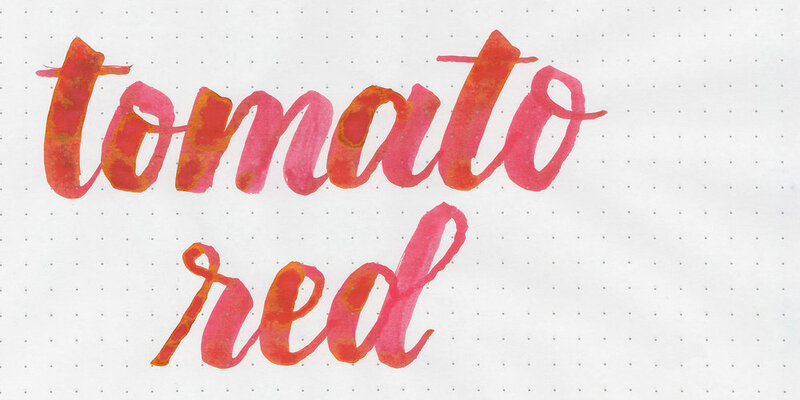 This ink is bright, much brighter than the tomatoes I usually find. Tomato Red is a vibrant cheerful red. In large swabs you can see the small pop of gold sheen. Tomato Red is very similar to Sailor Jentle Irori and Taccia Aka Red. In writing it’s hard to tell the three apart. Click here to see the Kingdom Note inks together, and click here to see the red inks together. I used a Pilot Vanishing Point Raden Galaxy with a medium nib on Tomoe River paper. The ink had a wet flow. Overall, it’s a really great red ink, but I do wish it was easier to procure in the United States. It’s got some pretty gold sheen and a nice wet flow. Ink review of Kingdom Note Mycena Pura. Ink review of Monteverde Charoite. 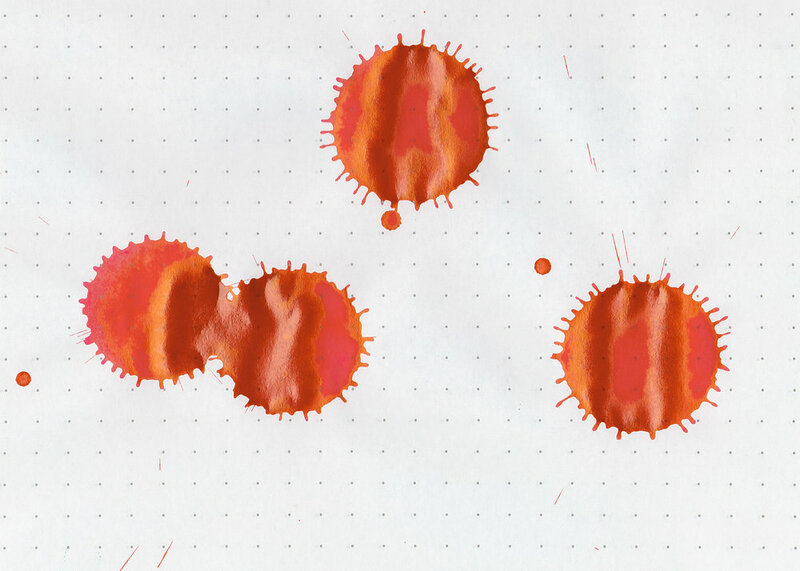 Ink review of Monteverde Erinite. Ink review of Monteverde Topaz. Ink review of Robert Oster Crystal Marine. A discussion on the evolution of handwriting over the last 600 years, the styles I was taught in school, and the styles I use today. Ink review of Robert Oster Avocado.